Spring blooming shrubs and perennials one by one are deciding to visit at least a couple of weeks early without exception this year. Oh how I wish confederate jasmine (Trachelospermum jasminoides) would be this early every year. If all those clusters of snowy-white pinwheel flowers would just hang on for longer than two months of the year it would be an even lovelier wonder in the garden! Its fragrance is divinely fresh and fills the morning air and again in the evening hours. During the day the lemony fresh scent is evident but not as drifting and arresting. It never fails to make heads and noses search for the source of its sweet fragrance when an unsuspecting visitor is in my garden any time of the day. There is a fence surrounding my edible garden. Long before the space was used for edibles the confederate jasmine was planted on the length and width of it (approximately 60' by 30'). Above is the gate that opens to the back gardens. Yes, there is a gate under there. Want to go through it with me? 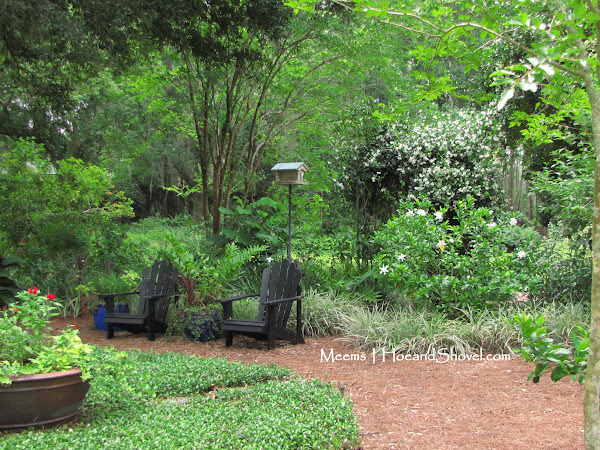 A walk around to the circle garden and take a look just beyond the seating area to another location the jasmine has been growing for about 15 years. 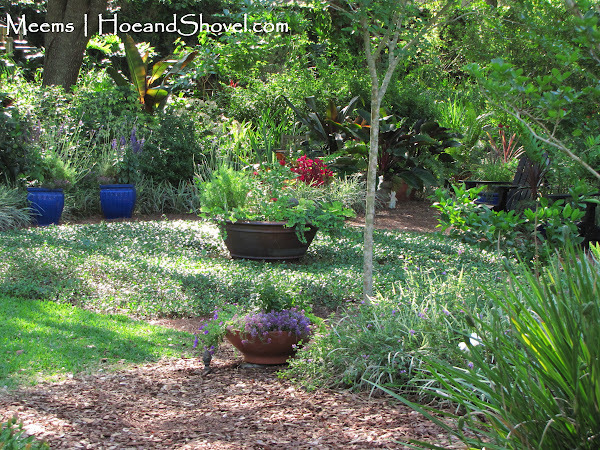 It is tucked between a single trunked Japanese privet (Ligustrum japonicum) and the edge of the oak tree canopy. Can you see the archway just behind the chairs? Jasmine was planted on only one side in anticipation of another vine twining up the opposite side and merging with the jasmine. Queen's wreath (Petrea volubilis) merges with jasmine at the top. From this view further out into the garden the shape of the arbor and the jasmine is more evident. 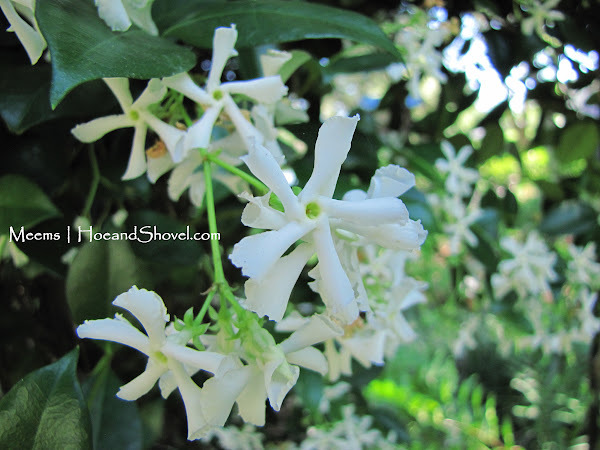 Confederate jasmine can grow in full sun but will also perform well in partial sun. It does take a little longer to mature with less light but as you can see, once it does, it will bloom just as profusely as one in full sun. It is both drought tolerant and cold hardy. To add even more fragrance to the circle garden (behind the seating area~ in front and to the right of the arbor) the gardenia bush 'Miami Supreme' is filled with buds and has just begun to bloom this week. These are the plants that can be counted on year after year to bring the garden consistency and durability with evergreen foliage in winter and summer. 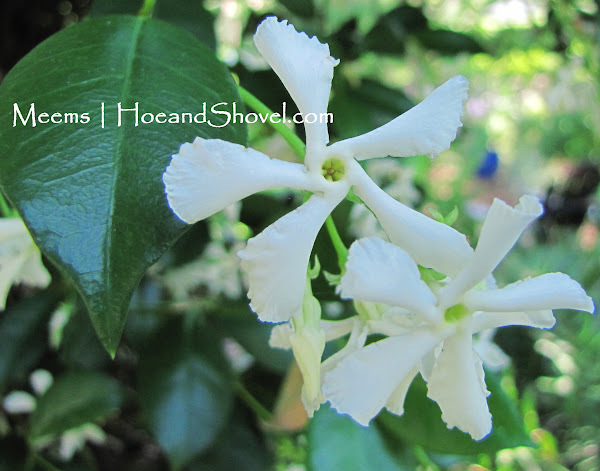 The favorite white fragrant blooms make them even better choices for a Florida garden. What's filling up your senses in the garden right now? Why don't I have any Confederate jasmine in my garden? I must remedy that! Love the view through your circle garden. Your beautiful garden looks very inviting. My favorite scented plant is the almond bush...smells like almond extract and blooms most of the year. What an incredible addition to the garden. I want one! Can these be found in many nurseries? Okay..now I must have confederate jasmine AND a gardenia bush! I could just smell them as I was reading your post. I have loved their scents for many years..just running out of room in my gardens. Where there's a will..there's a way! That was a nice idea to merge it with Queen's Wreath! I had a gardenia a few years ago and, like for so many people, mine was temperamental and slowly going downhill. I finally pulled it out. I am thinking about getting another one and if I remember, the Miami Supreme has the largest and showiest flowers of all of the gardenias. Yours is gorgeous! Is it on grafted rootstock? I know that gardenias are subject to root knot nematodes and I have been told to buy one grafted on 'Gardenia thunbergia' rootstock, which resists root-knot nematode attacks. I think it was nematodes that got mine, but I was such a novice at the time that I didn't know to look at the roots when I pulled it. Happy gardening, Meems. Thanks for another great blog! We have Confederate Jasmine growing too and I LOVE it. Never thought of having it grow on the ground. Love that idea. Confederate jasmine is blooming away and filling the air with its' sweet scent. I have my 'first' gardenia bud on one of the two rooted cuttings that Tom from 7th St. Cottage in NC sent me. I can hardly wait for it to bloom so I can smell that wonderful scent. The gardenia scent is one of my earliest memories of FL as a little girl. There is just something about their scent that grabs you. I love them and haven't had luck with growing them. These two cuttings are about 18" tall in tera cotta pots. My passion flower blooms perfume the air also as do the star jasmine. We've been getting some much needed rain and I am thankful. Oh by the way my first Miss Muffet leaf has sprouted for this season. What a thrill to see that the other day. Thanks again. Oh yes. The sweet fragrance of the confederate jasmine is dancing on the breeze here too. It's quite nice seeing how several neighbors have it too. A few gardenia blooms. My gardenias are not very happy. 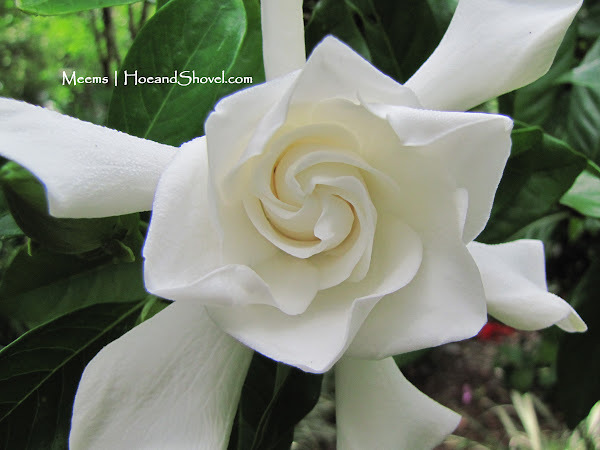 Are their secrets to successful gardenias bushes? Meems, what was the purpose of the railroad ties between the fence and the jasmine? Were those to keep the puppy from digging under the fence, long ago? If so, GREAT idea! Or did you have some other, even better purpose in mind? Confederate jasmine fragrance hangs heavy in the air here with Magnolia 'Little Gem' adding that lemony perfume from another direction. There's only been one little gardenia blossom so far but buds are abundant. Roses too add their scent. For Darla: there is a trick to Gardenias. Don't love them to death. They will grow in sun or shade and a cutting will root in a Coke bottle. They do respond to a small dose of Epsom Salts in the spring. It makes me want to sit there, close my eyes and just breathe deeply. 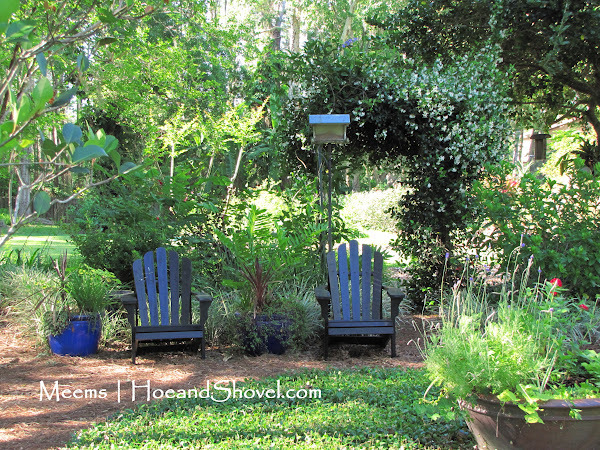 Confederate jasmine and gardenias...two favorites and two must-have plants. Your circle garden has filled in nicely. Our Jasmine is nearly finished blooming,so sad :(. Our neighbors have a pergola covered in jasmine. I look forward to this tie every year because I am right in the "scent zone" for it! I am thinking I need to plant some Confederate Jasmine in my yard too. It looks so nice and I bet it smells heavenly. I didn't realize you didn't have some. You have some fences you could cover I think! My almond bush is not far from the jasmine and the gardenia... fragrance is very strong in that area. It is quite common and should be found in nurseries and big box stores. You will figur it out! When we drive up into the driveway at night the scent of jasmine is very strong in the air. The Miami Supreme is grafted and should resist nematodes. 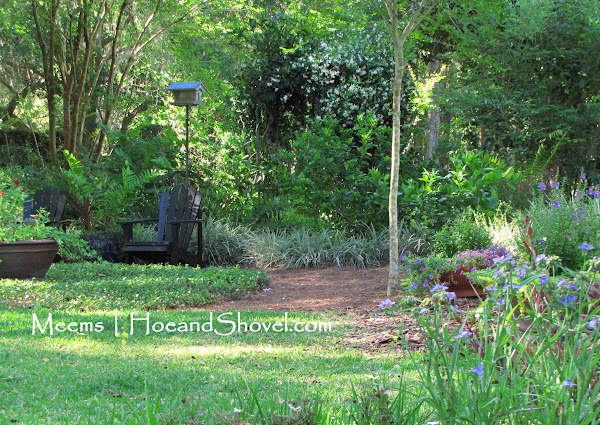 I don't have jasmine on the ground but I have used it as a ground cover for my clients. It is beautiful that way. Unfortunately my star jasmine is located in too much shade and consequently not blooming well. I love that fragrance too. Glad your Miss Muffett patch is returning! I like Nell Jeans advice. I don't know why the blooms would drop off... is it possible the plant roots are too wet? It likes moisture but needs a well draining soil. There are so many flowering ornamentals blooming in April! We do that at night! I wish you the best with your gardenia and jasmine... maybe when it warms up for you? Definitely must-have on my list, too. You can add it on a trellis but once it matures you will have to keep it tamed back. It is not super aggressive but it will wind its way around anything nearby. We never want it to stop! But it does eventually. And then we wait another whole year. 2 years is pretty fast for this jasmine... it must be in the perfect conditions. Sometimes this one takes a while to get going. 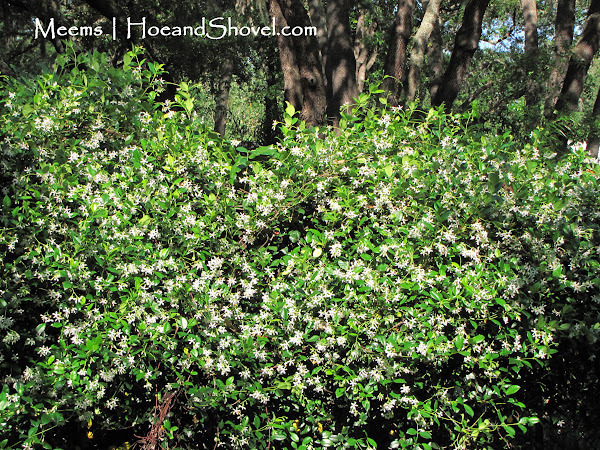 This jasmine is a great option and would probably work in your garden, too.